This is the second year this workshop is being held. It will start at 8:30am because last year we felt some extra time would have been useful. A morning tea wil be provided after initial talks about site preparation, planting and maintenance regimes, and then we wil go to an area where hole digging and planting can be demonstrated. Mark McCaffrey, Ian Freeman and Peter Snodgrass will again be doing the talks and demonstrations. The workshop is expected to finish about 123.30pm. Please register with Barbara Lanskey (Ph 4091 4468) if you wish to attend the workshop. Ian's property is near Lake Eacham on Cutler Road off Lake Barrine Road. This workshop is held every year and we are fortunate to have our presenters on a regular basis. Alan and Maria Gillanders will present the tree identification section and Peter Snodgrass will present the seed propagation section. For this workshop, tree identification is by observing differences in leaves, and Alan and Maria bring along many samples from their property. Some observations require the use of hand lenses and these are supplied by TREAT. More trees are fruiting towards summer so Peter sources a good supply of different seed types to demonstrate various sowing techniques used in propagation. If you wish to grow your own trees from seed, Peter's extensive knowledge is on hand to share with you. This workshop is split into 2 sections with a morning tea provided by TREAT between the sessions. It is scheduled to finish at 12:30pm. Please register with Barbara Lanskey (Ph 4091 4468) or the Lake Eacham nursery (Ph 4095 3406) if you wish to attend. The Christmas party break-up morning tea will be on Friday 19th December. Members attending Friday morning working bees usually bring along some extra goodies to share, and TREAT buys some special fare from the left-over morning tea money collected during the year. QPWS staff from next door come along for the occasion and we encourage various members we don't often see to come and say hello again. The nursery is closed for the Christmas - New Year break and the Friday morning working bees start again on 9th January. What can dung beetles tell us about restoration plantings? I did not predict that the wet autumn would continue with more wet days than usual but it seems that the end of the year will be fairly typical as far as rainfall and temperature. We can expect dry weather interspersed with storms. Isn't it great that we live in this part of Australia where our extremes are not that extreme at all and the seasonal variability is not so high either? The Podocarps had a great production of male catkins and I am presuming that there will be a commensurate crop. Look for Podocarpus dispermus in the wetter escarpment country, while P. greyi and P. amarus are more widespread. The Prumnopetes ladei in my garden has set a good amount of seed but I am not sure of what has happened in the wild. In our household we use cuttings of this beautiful native conifer as our Christmas tree. Other good natives for this purpose are Casuarinas which are not conifers at all but do look like them and Callitris. The red in the forest of the Tree Waratah, Alloxylon, will be replaced by the red of Black Bean, Castanospermum, and Flame Tree, Brachychiton. Terminalia sericocarpa has not yet flowered at the time of writing but may have done so by the time you read this. The fruit which is very high in vitamin C will start to ripen in November. They are highly attractive to fruit bats and birds but before they ripen Green Ringtail Possums may be seen feeding on the green fruit. 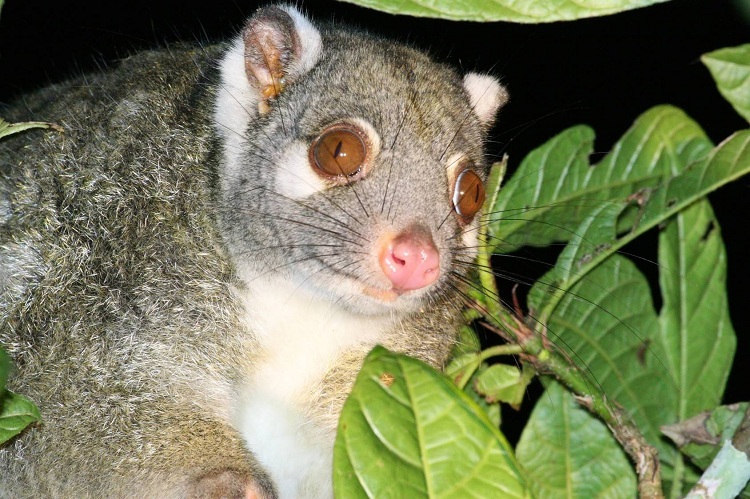 Look for these lovely little possums on horizontal branches below the canopy. Their camouflage makes them hard to spot but I find that if I look at the trees rather than scan for hairy lumps I find them more easily during the daytime. The fruit of Pink Poplar, Euroschinus falcata, is also eaten by Green Ringtails before they ripen in the early wet. At this time they earn their other common name of Pigeonberry Ash by the frugivores they attract. However this common name is applied to at least two other trees in Australia and more overseas. This is a prolific breeding time. Watch for young possums on their mothers' backs. Male Antechinus will have fought and fornicated themselves into an immune collapse and death by the middle of November. Currawongs, magpies and crows will be feeding young but not necessarily their own. The large cuckoos, Channel-billed and Koel, are brood parasites, laying their eggs in other birds' nests. The only Australian Cuckoo which raises its own young is the Pheasant Coucal. These normally nest on the ground but may build a nest up to four metres high in a shrub. There is growing evidence of cuckoos returning to reclaim their fostered young and finish their raising. If you ever see this, please photograph and let me know. If collecting seed of Ivory Curl, Buckinghamia celsissima, for growing in your garden can I suggest that the form from Yungaburra and Peeramon is the one to go for. This is the first one introduced into cultivation and is still the best for gardens because of its shape and ability to flower profusely under most conditions. The Glochidions are an alternative food source to figs for the Double-eyed Fig Parrots but I think the parrots will have to rely on their usual fare this year as the flowering has been sparse and I see little sign of fruit set. If we get good early storms this may change. One genus which has generally set lots of fruit ripening at this season is Flindersia. Commonly called maples, ash, hickory and even pines, these trees are rainforest emergents more closely related to oranges and lemons than their northern namesakes. The fruits open as five fingered stars and make wonderful Christmas decorations so hang up your collections by the stems and cover with a bag. Once you have collected the winged seeds and thrown out the dividers (not the other way around) your children or those of the neighbourhood can help you paint them to decorate your tree or door for the festive season. Diploglottis diphylostegia is a reliable food source for many birds and makes a great marmalade. Chutneys and sauces made from this fruit are often among the tastiest. Talking of edible fruits Antidesma bunius, Herbert River Cherry, will be ripe with its small apple tasting white to red fruit. Once again, don't shove something in your mouth unless you are sure of your identification, and even then ask your friends to try it first! 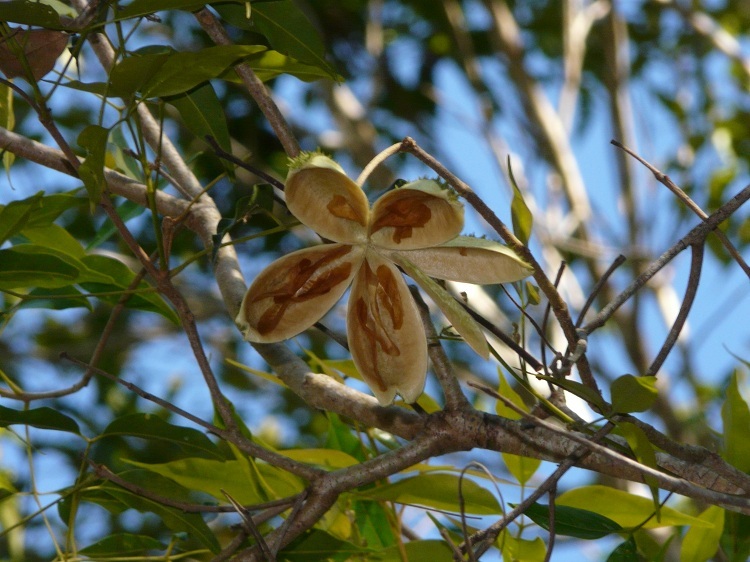 Atractocarpus fitzalanii and A. merikin will ripen during the period of this newsletter. These two native gardenias have white fragrant flowers and their yellow or red fruit contain many flat seeds inside. While the former can take full sun the latter is best in at least half shade. As for me, in this season I'll be looking for full shade. Funding from a 'Friends of Parks' grant from the State Government recently enabled TREAT to replace 18 sets of concrete block supports for the seedling benches inside Lake Eacham nursery with galvanised pipe stands. In July, TREAT secured a grant of $3000 from the Foundation for Regional and Rural Renewal (FRRR) to replace 22 sets of the old concrete block supports for benches outside in the hardening bays with galvanised pipe stands. Besides being more sturdily supported, the benches are now at a much more comfortable and safe working height for our volunteers. The stands were erected during August. This grant was kindly received through the Viertel Family Trust. Many funds disbursed through FRRR are donated by private family trusts. There are further stands to be replaced in the hardening bays and TREAT continues to look for funding opportunities to achieve this. Some stands have been purchased with TREAT funds. There are many weeds on the Tablelands but one that does not seem to be particularly well known in this area is Cat's claw creeper - Dolichandra unguis-cati (previously Macfadyena unguis-cati). Like many weeds, it is a garden escapee first reported as weedy in the 1950s. It is native to Mexico, Central America and tropical South America. Cat's claw creeper has large bell-shaped, bright yellow flowers that some might consider pretty. Whenever I see a weed in flower I just think of the work required to control it. Another characteristic feature is the tendrils which affix the vine to tree trunks or any suitable surface. Cat's claw creeper tends to have a tighter hold on any tree that it is growing on than any other vine species. When I first started working in Mackay I was not familiar with Cat's claw creeper so I took the opportunity to assist with control efforts at Rowallan Park Scout Camp. Included in the tools handed out were screwdrivers to lever the vines off the trees so they could be cut with secateurs. Cat's claw creeper usually flowers in response to our storm season rains from October to January, so this is a good time of the year to notice any infestations. The reason it is particularly difficult to control is because it develops a series of tubers as the plant matures, at approximately 50 cm intervals along the lateral roots. 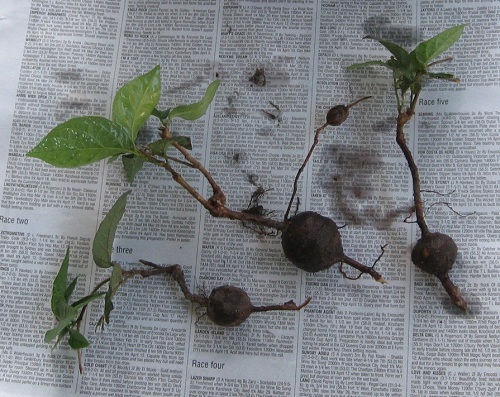 If it is controlled by cutting the vine and painting the stump with herbicide (Glyphosate), this can appear successful at first, but the herbicide only kills the first tuber, and then the plant regrows from the next tuber. Cat's claw creeper is a Class 3 declared pest plant under Queensland legislation so it should not be sold or given away anywhere in Queensland. 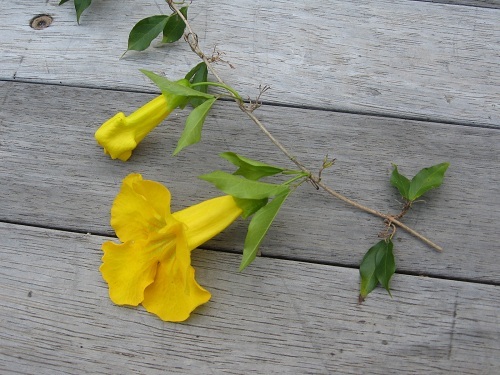 In April 2012 Cat's claw creeper was added to the list of Weeds of National Significance. Cat's claw creeper is a transformer species, because of its capacity to completely alter native ecosystems, including changing the soil chemistry. It smothers and kills mature trees, opening up the canopy for light-loving weeds. In areas where there are no standing structures, it forms dense above-ground mats that prevent growth and germination of desirable understorey vegetation. Cats Claw Creeper smothering trees - highly visible when in flower. 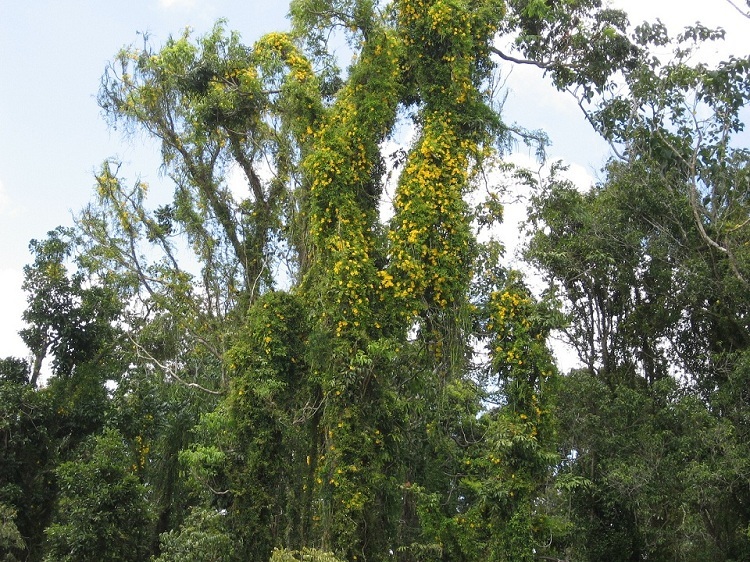 Cat's claw creeper has been targeted for biological control. The following insects have been tested, found to be host specific and approved for release. The tingid bug, Carvalhotingis visenda, and the leaf-tying moth, Hypocosmia pyrochroma, have been released widely and field release of the leaf-mining jewel beetle, Hylaeogena jureceki, commenced in September 2012. The tingid bug is widely established in the majority of release sites and has caused visible effects in some areas. The leaf-mining jewel beetle is highly target-specific and can severely damage Cat's claw creeper. I have released the leaf-mining jewel beetle on the Cat's claw creeper infestation at Priors Creek in Atherton. To help prevent the further spread of Cat's claw creeper on the Tablelands TREAT would like to get a better understanding of where it occurs on the Tablelands, so if members would report any infestations they notice or are aware of, to me (Simon - sbburchill@gmail.com or mb 0407 091347) I will endeavour to confirm identification and map the infestations. 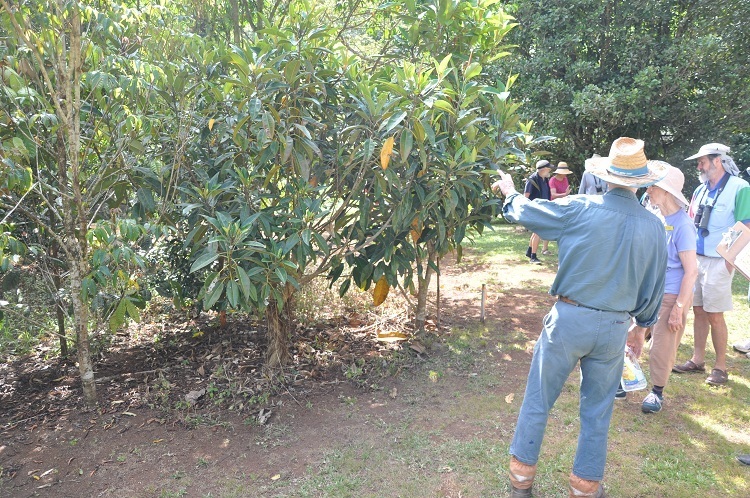 This will help us to obtain and release more of the biological controls as a first step in containment of Cat's claw creeper on the Tablelands. Dept. of Agriculture, Fisheries and Forestry Biosecurity Queensland, 2014. Cat's claw creeper Macfadyena unguis-cati, Queensland Government. Weed Management Guide Weed of National Significance, Cat's claw creeper Dolichandra unguis-cati, Caring for our Country Australian Government. As we know, reforestation is a major strategy to mitigate biodiversity losses and increase ecosystem service provision. Reforestation practitioners and advocates have an intrinsic understanding that restoration plantings aid rainforest recovery. Indeed, there are a number of studies showing how restoration plantings in the Wet Tropics can restore vegetation structure, faunal diversity (including birds, reptiles, ground beetles, mites and ants) and can increase the carbon storage potential of previously cleared land. However, less is known about the recovery of important ecosystem functions and processes in restoration plantings. For example, we may see that bird communities are recovering in restored sites, but does that mean that pollination and seed dispersal processes are recovering at the same rate? It is important to understand the functional implications of restoration plantings, as complex interactions and ecological processes are crucial in creating diverse, sustainable ecosystems (the goal of restoration). For my PhD at Lancaster University (UK), in collaboration with CSIRO, I am investigating how elements of faunal biodiversity (dung beetles, mammals and leaf litter decomposers) and their associated ecological functions are responding to restoration plantings on the Atherton Tablelands. I am looking at how age of planting influences biodiversity and functions, using a chronosequence approach (a range of plantings of differing ages). I have 20 study sites on the Tablelands which comprise four ungrazed pasture sites; four young restoration plantings (0-5 years old); four mid-aged restoration plantings (6 -13 years old); four old restoration plantings (14-25 years old); and mature rainforest plantings. 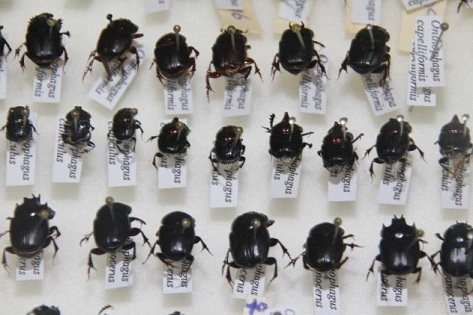 Why look at dung beetles? One element of biodiversity that I am investigating is dung beetles. These rather uncharismatic micro-fauna are excellent bio-indicators as they are highly sensitive to habitat changes. They can detect small differences between habitats and thus tell us a lot about how restored plantings are recovering. Dung beetles are largely coprophagous (i.e. they eat dung), and although some species feed on rotting fruit, fungus and carrion, all species require dung to brood their larvae. Australian dung beetles use one of two nesting strategies: 'tunnelers', which bury dung balls in tunnels close to the dung pile; and 'rollers', which roll dung balls some distance from the dung pile before burying it. Through the act of removing and burying dung, dung beetles provide key ecosystem functions which are important to forest dynamics. The transfer of dung below the soil surface relocates nutrient-rich organic material and instigates micro-organismal and chemical changes in the upper soil layers, which is important for nutrient cycling and soil health. The movement of relatively large quantities of earth to the soil surface (bioturbation) during dung burial increases soil aeration and water porosity. Dung beetles often relocate and accidentally bury seeds that are present in dung (secondary seed dispersal), which benefits seed survival by reducing seed predation and mortality and reducing seed clumping and therefore competition. Dung beetle activity also serves to control the abundance of dung-dispersed nematodes, protozoa and flies, which has implications for livestock, wildlife and human health and wellbeing. To find out how dung beetle assemblages are responding to restoration plantings, I am working with Dr. Rosa Menendez from Lancaster University and Dr. Geoff Monteith from Queensland Museum to sample dung beetles at each of my study sites, using baited pitfall traps. We are looking at whether dung beetle communities become more diverse with planting age, by assessing whether older reforestation sites have higher numbers of species (species richness), numbers of individuals (abundance) and biomass (the total mass of dung beetles caught at a site). However, simply looking at species richness, diversity and abundance doesn't tell us the whole story and so we are also looking at whether restoration plantings become more similar to rainforest, in terms of their species composition, with planting age. Following on from this, we are asking what types of species are driving these changes in community composition? And what roles do these species play in the ecosystem? To answer this, dung beetles are split into functional groups and the response of each of these functional groups to reforestation is assessed. There are a range of functional groups that dung beetles can be divided into, but we are looking at particular functional groups that are likely to be sensitive to habitat changes, and that are important in terms of regenerating forests. These include nesting strategy (i.e. rollers, tunnelers); body size (i.e. large, medium, small); feeding preference (obligate dung feeders, obligate fungus feeders, generalists); and diel activity (diurnal, nocturnal, crepuscular). This provides us with information on how functionally diverse a dung beetle community is, and gives us an insight into the variety of ecological niches available for dung beetles in a particular habitat. The next question we are asking is how does the change in dung beetle community composition and functional diversity affect the ecological processes that dung beetles mediate? To answer this, we are conducting replicated in situ experiments at each study site to look at how efficiently three different ecological functions are being mediated by dung beetles. These functions have been selected as they are particularly important for regenerating forests. 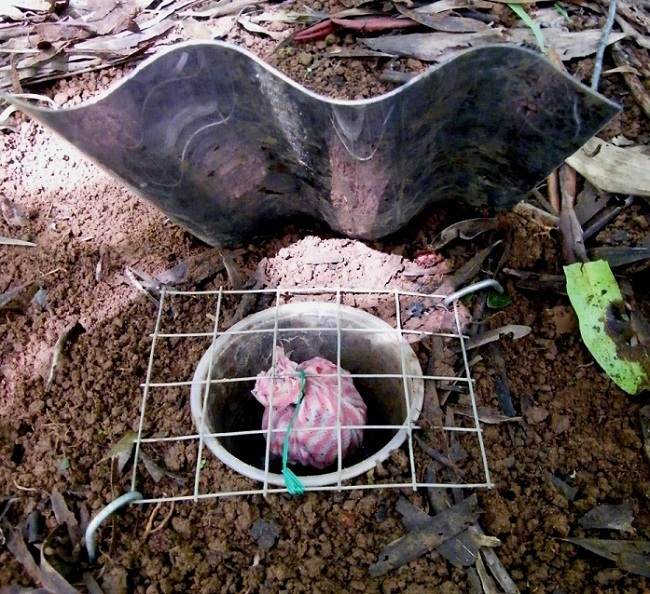 These functions are: dung removal (how much mass is removed from a 50g dung ball after 2 days); bioturbation (how much soil is displaced from beneath and next to the dung ball after 2 days); and secondary seed dispersal (how many plastic seed mimics are removed from the dung ball, from a starting total of 30). Changes in dung beetle mediated functions in restored plantings have implications for nutrient cycling, soil health and plant recruitment. As such, if functionally diverse dung beetle communities can be established in reforestation sites early on, this will have positive effects on soil health, stability and successional processes. Finally, we are looking at whether any particular species or functional groups are key drivers of functional responses, and which habitat characteristics lead to more rainforest-like dung beetle communities and functions in reforested sites. To get an idea of how restoration plantings influence biodiversity and functions at a broad level, I am looking at a range of taxon and functions, spanning different trophic levels. In addition to looking at the responses of dung beetles and their associated functions, I am also looking at the responses of small-medium terrestrial mammals; leaf litter invertebrates and leaf litter decomposition rates. I hope that my research will culminate in a better understanding of both the biodiversity and the functional implications of restoration plantings and will provide landowners and restoration practitioners with a clearer idea of what to expect from their plantings and how to encourage the recovery of different elements of diversity and their associated functions. Many members have projects on their properties where they want to plant trees. TREAT has a memorandum of understanding with QPWS and trees can be obtained free for these projects subject to project approval by TREAT and a limit of 300 trees per project per year, non-cumulative. Quite a few members have long-standing revegetation projects and regularly apply each year for trees. The limit of 300 applies to allow many members to benefit from a finite resource, and 300 trees is a significant number of trees to care for, particularly by members new to planting. If you have a project on your property and wish to apply for trees, application forms are available at the nursery. If you can't get to the nursery, ring Ken on 4095 1208 and a form can be posted to you. All new members with a project should attend TREAT's planting workshop in November to learn TREAT's standard of site preparation, planting and maintenance. For new projects, two or three experienced TREAT members will visit your property at an arranged time to check out the project, give advice if required and then report to the management committee which decides on which projects are approved. Trees are made available on a first come first serve basis, so get your applications in now for planting trees this wet season. In the 1990s, revegetation programs along the Hunter River in NSW adopted a planting method developed by Bill Hicks. This involved growing native trees to an extended length in forestry tubes and then planting them deeply. He reasoned these trees would have a better chance of survival from floods and predation, and their root balls would be protected from hot and dry surface conditions. Survival rates did improve by 20-50%, and it was found that the submerged stems generally weren't susceptible to fungal attack and in fact developed adventitious roots, increasing nutrient access and structural support for the plant. Other revegetation groups started using the technique, though no data is available as to their success or failure. Planting in the tropics is very different from planting in temperate areas, but could the method be beneficial up here? Being the scientist he is, John Clarkson decided to do a small trial with 'deep stem planting' at his property 'Galaji', as part of the revegetation program there. John chose a flat area to plant 6 trees each of 30 species (from 11 families), typical of the revegetation species used in his area. The trees came from the Lake Eacham nursery, and were chosen for sameness, with longer stems if possible. They were in the usual super tubes rather than forestry tubes, as plants are grown bigger in the tropics to compete with the weeds when planted. 'Galaji' is at Topaz, a very wet part of the Tablelands, so the Clarksons plant from February - April and don't water trees. They don't fertilise them as this seems to encourage bandicoots to dig them up, and don't mulch, again to discourage bandicoots plus feral pigs. For the trial, John said he was more attentive to maintenance than usual, spraying weeds while they were still very small. The site was prepared by spraying, and the trees were planted on 4th April 2010. The species were planted in pairs, one at the usual depth and the other planted half the stem length deep. A week prior to planting, John removed the bottom few leaves from all the plants to avoid possible fungal infection of the deeply planted trees. The 3 sets of pairs for each species were randomly positioned though the planting area. Apart from maintenance for weeds, John did not interfere with the trial trees once they were planted. He observed what lived and died and found that pademelons sometimes liked to eat the leaves of some species but in others they preferred a stem or leaf stalk. None of the trees were dug up. He started monitoring by counting the number of leaves and measuring the height of each stem, but as the survivors grew bigger he just measured the diameter of the stems. At the TREAT field day on 27th September, the trees were four and a half years old. For 5 species, all of the 6 trial trees died from the effects of animal grazing within 3 weeks of planting. These species were from 5 different families. For 5 species, more deeply planted trees died than shallow plantings but whether this is statistically significant has yet to be tested. No difference in survival of deep or shallow planted trees was apparent in the other 20 species. The growth rate of the surviving trees exhibited the usual differences between species but there were often marked differences in growth between the trees in a pair. We started to predict which tree was deeply planted and which was not and got John to check his planting records. Sometimes we got it right, but often we were wrong, even when comparing 2 pairs of the same species. There was no definite pattern, and we had to agree with John that deep planting in the tropics was initially indicating no clear advantage or disadvantage. John said he'd continue to measure the diameter of the trees as they grew, but many other variables such as shading from adjacent faster growing species might confound the results. So the take home message was to keep planting as usual - firm each tree down, don't plant high, but don't worry about trees being planted a bit deep. There was one patch of the planting where all the trees had died. John wondered whether it was an area where chance had brought together the 5 species pademelons particularly liked to browse but other explanations cannot be discounted. Someone suggested heat from a burnt log pile and another wondered about termites. Field days are a good way to share knowledge, experience and thoughts. Many of us were interested to look at the area at the other end of the property, where we'd observed Alphitonias growing en masse at the last field day in 2010. The area had been used for ginger production by previous owners but being next to intact forest, the Alphitonias had colonised the paddock when cropping ceased. Now the alphitonia pioneers were sorting themselves out, some dying and others growing much bigger, but the impressive observation was that other recruits were establishing in the understorey and the grass was now growing only on the edges. Some of the new recruits were 2-3 metres high. All this without intervention. John also pointed out the forest area on the hill the other side of the creek which runs through their property. This was cleared about 40 years ago and was sparsely treed with a lantana understorey when he and Marion bought the property 11 years ago. With no intervention it was returning to forest and looking more and more like the intact forest next to it with the passing years. Leaving nature to do its work can be very successful with high rainfall and adjacent intact forest. John thought the alphitonia area could be worth studying - for regrowth species, how many, whether wind or bird dispersed, secondary pioneers, etc. We returned to the large verandah of the newly renovated house for refreshments. Many took the opportunity to be shown through John and Marion's new quarters. It was such a pleasure to visit the property for a second field day. This year's AGM, TREAT's 32nd, was held on 5th September and following the various annual reports the outgoing committee was re-elected unopposed for the new year. We had the honour of having the formation and history of our organization celebrated and conceptualized by our guest speaker Nigel Tucker, Principal Environmental Scientist of Biotropica. Nigel took us back to our founding members and their vision and passion for the future. We were humbled to come to an awareness of the fact that most of the dynamics of TREAT were set in place some 30 years ago as leaders in their fields professionally, at the time of the creation of the Wet Tropics, formed this group. There were at the time no other groups focussed on repairing the rainforests in our area. Nigel spoke not only of the concept of being intensely aware of the provenance of the seed stock species for plantings, but also of the concepts of community, indigenous cultural heritage and the gathering of people impassioned by the concept of re-establishing the ecosystems that pre-existed European settlement and its impact on these diverse and rich communities of plants and animals. It was a tremendously moving and humbling experience to realise what a solid foundation our organisation has, and many of us are searching ways to reach out to more people in the local and wider communities to further this passionate work. TREAT has a video of the presentation - rather large - on the computer at the Nursery. If anyone who missed the presentation would like to see it, please contact me. It has been a quiet year for TREAT. Having said that, we held our first ever Planting Workshop last October at Ian Freeman's property. It was a huge success with the only negative being that we didn't give ourselves enough time to cover all aspects in as much detail as we would have liked. Learning from that, we will start earlier this year and try to condense some of the content. Thankyou to Mark McCaffrey and Peter Snodgrass for presenting and to Ian Freeman for both presenting and hosting the event. Our second workshop, the Plant Identification and Propagation Workshop, was again well attended and extremely successful. Thanks go to Alan Gillanders and Peter Snodgrass for all the hard work they put in to create a beautifully presented, and useful presentation. Thanks also to Barbara Lanskey for organising both events. The planting season started in December with a Tropical Tree Day planting at Bonadio's, organised by Geoff Onus. This was followed by two plantings at Ian Freeman's, part of TREAT's Peterson Creek Corridor project, two plantings at McCaffrey's Ringtail Crossing Nature Refuge, one on National Park land at Massey Creek, Ravenshoe, one on South Endeavour Trust's property forming part of the Rock Road Corridor, one at Christine Doan's property on Ginn Road, Malanda and one at Emms' property Cedarvale at Lake Barrine. Thankyou to all the volunteers who came to plant or put on the BBQ, at each event. All together about 20,000 trees were planted, of which about 7,500 were propagated by TREAT, with the rest being from the TRC nursery and other local sources. Approximately 8,600 trees were also supplied to TREAT members in lots of 300 or less, for their own projects, resulting in wonderful improvements to wildlife habitat across the Tablelands. Propagation of trees has continued at a controlled pace at the nursery thanks to the expertise of Nick Stevens and his ever dwindling team, now down to two, Peter Snodgrass and Darren Caulfield. Thanks also to all the Friday morning volunteers who, come rain or shine, process and sow the seed, pot up the seedlings, sterilise the pots, weed and size the seedlings out in the bays or put on the wonderful morning teas which we all enjoy. Our Display Centre continues to open 3 days a week thanks to our regular volunteers Bob Morrison and Jadwiga Czyz, our website is updated thanks to Simon Burchill and Elinor Scambler and our informative newsletter is produced quarterly thanks to sponsorship by Biotropica. Infrastructure in the form of new tables and benches, an additional sterilizing unit and stands for plant benches was provided by a Friends of Parks grant from the Queensland Government. Thankyou to Ken Schaffer for organising the quotes and getting the work done. 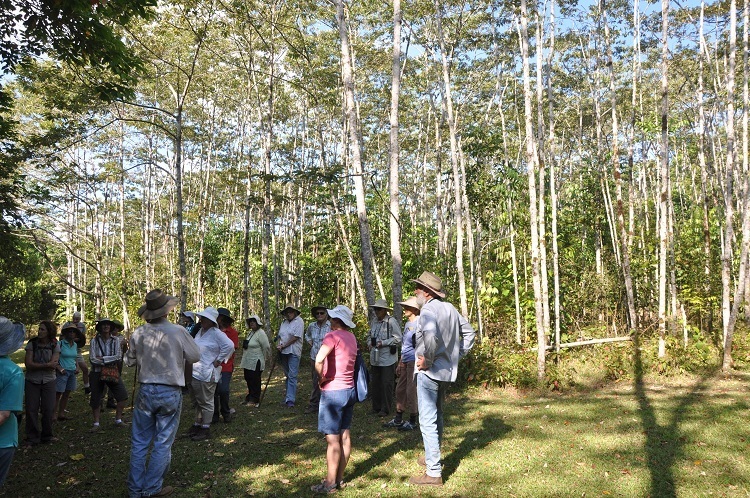 Winter is our field day season and we began with Emms' property, Barrine Park Nature Refuge next to Lake Barrine in May, Burchill's property at Peeramon in June, McCaffrey's Ringtail Crossing on Kenny Road in July and Dave Hudson and Robyn Land's Cloudland Nature Refuge on Seamark Road in August. All field days have been well attended, highly informative and enjoyable. We thank the landholders and the caterers. Lastly, I would like to thank all the current committee members for their hard work, enthusiasm and contributions ensuring TREAT has a well organised and bright future. Many of the pest and disease issues we experienced earlier this year have all but disappeared with most batches of plants recovering and growing vigorously. The outdoor nursery work leading up to this year's planting season will now be mostly weeding, pruning, sizing and sorting. Following the cooler months, seed collections are still down a bit but are expected to increase substantially over the next period leading up to and during the wet season. Spraying and fertilising maintenance has been undertaken at Massey Creek for the infill planting (of the 2012 planting) done in March this year. Most of the trees survived winter with a small number set back by light frost and damage from rabbits has also been noted. Preparations have commenced for upcoming plantings with initial site spraying and tobacco bush removal at Massey Creek for further infill planting this season. The following tables are a summary of the nursery annual production figures provided to TREAT at their September 5 Annual General Meeting and include 3 year comparison figures.